Anyone know anything about the TUF guys? I took notes on the episodes in the TUF 28: Heavy Hitters thread. Heavy handed American wrestler Justin Frazier will be facing Spanish wrestler Juan Espino in the men's heavyweight final while well rounded Pannie Kianzad will face the winner of Leah Letson vs Macy Chiasson in the women's featherweight final on Friday. Prices will dictate plays here. Pannie will likely be moderately favored over either opponent she faces while I think the men's line spread will be close. The Usman Dos Anjos line is off IMO. How does RDA win? Small tuf finale cage helps Usman. I think it’s gonna be a 5 round war. Don’t think Usman is gonna overwhelm him like Colby did. Usman doesn’t have Colby’s pace. I think Usman gets takedowns at will. And the threat of the takedown will allow him to win the striking. Just don't see RDA winning 3 rounds or finishing. RDA did well enough to win round 4 if I recall, and one other maybe but Colby's smothering pressure was overwhelming. I don't think Usman has quite that level of aggressiveness with his grappling. Colby only got one 49-46 and two 48-47s despite how dominant Colby seemed, so if RDA does just a little bit better against Usman it could be close or the other way. Can't resist 2u on RDA +252 at bookmaker. 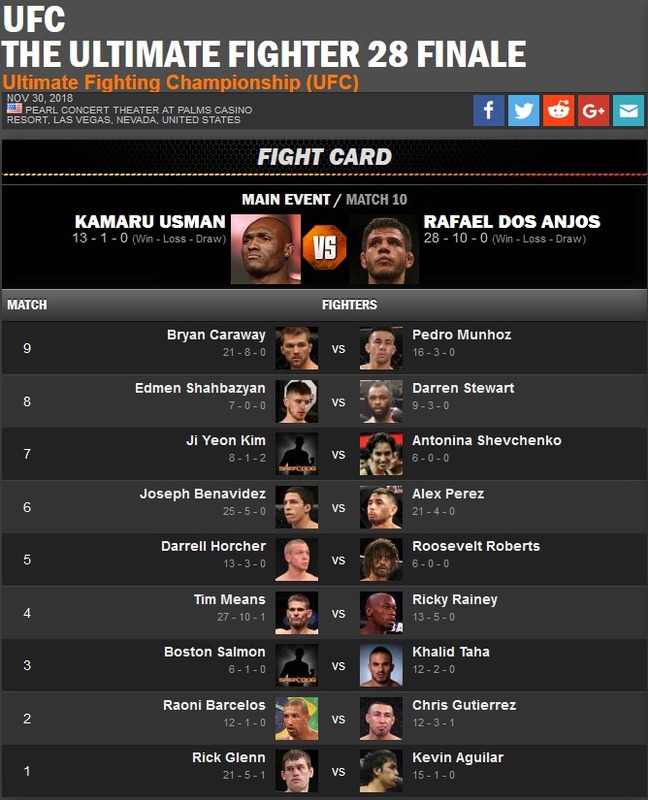 I have to bet the TUF fights so I can distinguish myself from the non-TUF watching casuals. Justin Frazier is dangerous on the feet and a very tough matchup for those he can outwrestle. So not exactly an easy opponent, but with Juan Espino's size, wrestling advantage and improving striking, plus training at ATT now, I think he's a good bet as a small favorite in the heavyweight final. Espino -130 to win $200. Juan Espino at -130 via size and superior wrestling. Frazier won't be able to outwrestle him as he did many of his other opponents and even though the American has powerful hands, Espino has a lot more experience against better opponents and some decent power in his punches himself. I believe Espino wins the season for male heavyweights. Pannie Kianzad at -130. She's far more experienced than Macy Chiasson, and more well rounded despite being smaller than true featherweight Chiasson. Should be able handle Macy on the ground too. They are also friendly for what that is worth so I expect this to go the distance with Pannie winning the season for female featherweights, despite being a natural bantamweight herself. Maurice Greene at -160. Cuban wrestler Michel Batista looked really fat at the weigh-in, terrible shape compared to his TUF run. Looked abysmal doing nothing and getting stopped in the semi-finals despite looking good in the quarter-finals. Much bigger striker Maurice should KO him early despite Batista's wrestling advantage and the small cage. Leah Letson at -193. She's much more well rounded and a finisher. Julia Stoliarenko panics and goes for submissions against lesser grapplers if she is not in control. I expect Leah to get a TKO stoppage after Julia fails to submit her or a wide decision victory. Greene/Batista Under 1½ -110, big value imho. Chasing, Put a bit more on Ji.